First, if you care about whether the gag is spoiled, look at the full cartoon before you read this post. A lot went into making this cartoon. That's mostly because I'm just not a good comics artist yet. I started teaching myself almost exactly three years ago during law school, sitting down and practicing about once a month since then. If you look at the crap I was drawing then, you'll see that I've come a long way for somebody with such a terrible work ethic. As I get better, I'll start drawing full pages and scanning them in, rather doing the different parts of the cartoons piecemeal, spread out onto several pages, the way I have with most of the cartoons I've posted. However, I still believe this walkthrough of my editing process will be helpful to cartoonists interested in digitally coloring and editing their hand-drawn webcomics. 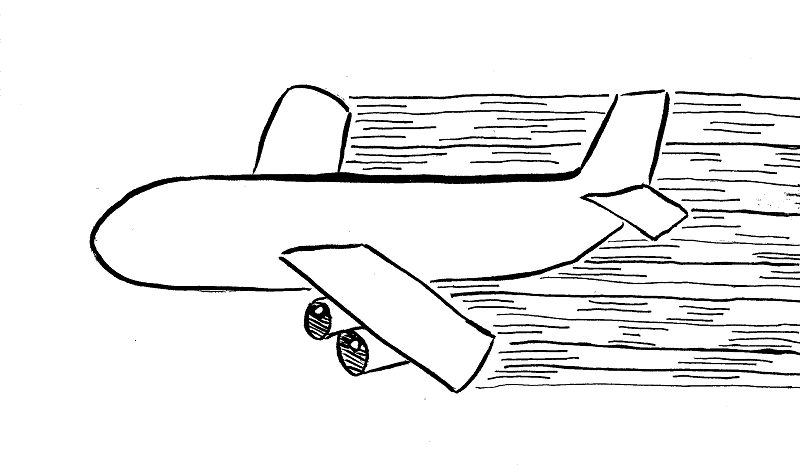 Scanned linework of a plane before editing it into the final cartoon. Tools used include the Pentel Pocket Brush Pen and Pigma Micron 03 and 05 markers. This most recent F-The-Cat post involved maybe eight to ten scanned pages for what amounted to a page-long gag cartoon. Everything was arranged and colored afterward in Photoshop. 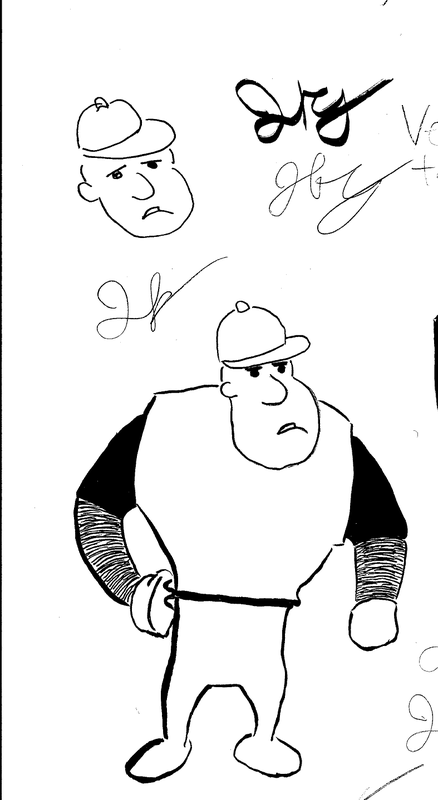 A scanned page with an early version of Rick the baseball player, floating miserably in the upper left corner. 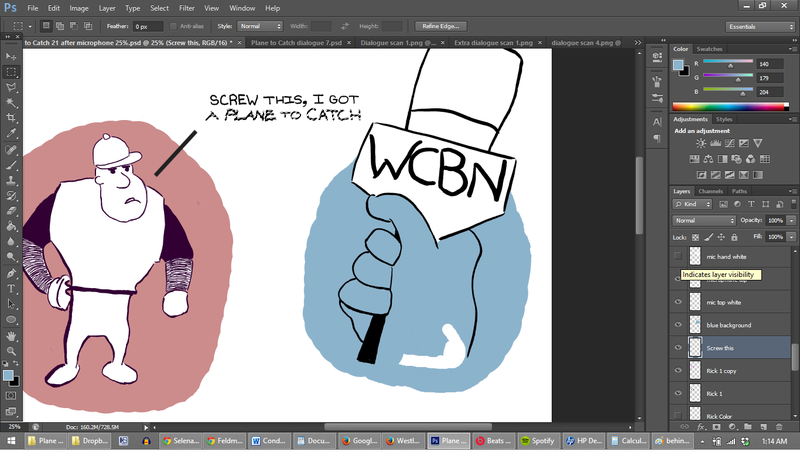 While hopefully I won't be tweaking my cartoons so much on my computer as I get better, I'll still be scanning them in black-and-white mode (rather than grayscale or color) and then coloring them in Photoshop, like most people who hand-draw their webcomics. This involves a lot of layers. As shown above, even though most of the foreground objects in this cartoon were black-and-white, I still had to use the magic wand tool to get rid of all the non-black parts of the cartoon scans, and then color everything in using a "coloring" layer below the ink drawing. Shown above: Glaring white speck in Rick's hat. 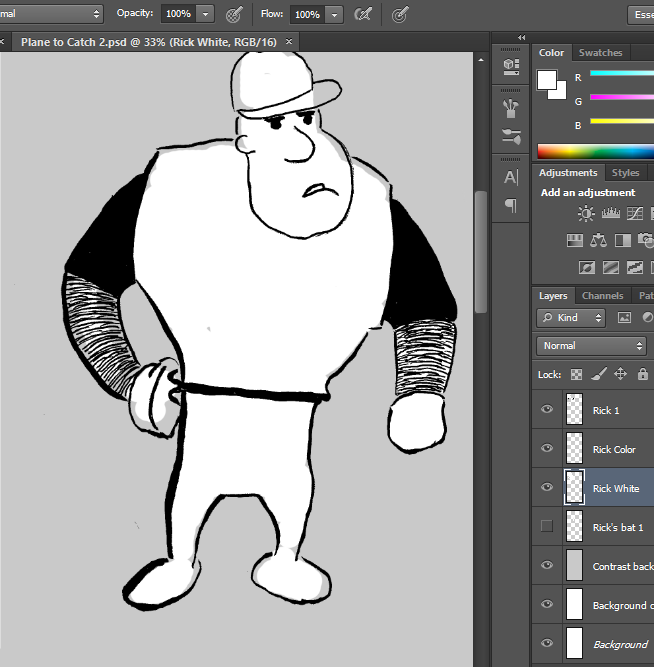 The single biggest change I made to the cartoon, however, was removing the other baseball player. 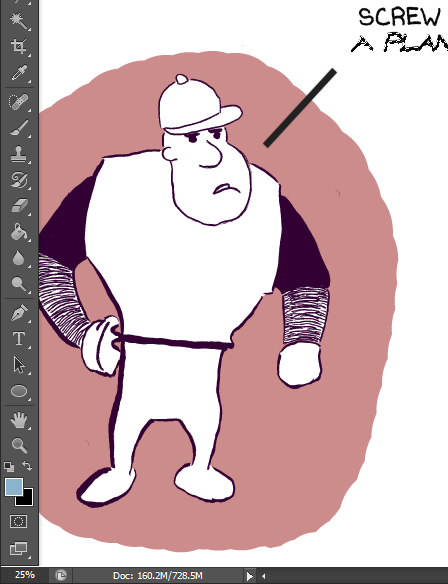 That's right, there was a second baseball player in the cartoon, telling Rick he should lay off the steroids. Ultimately I decided it would be better for a reporter to ask about steroids, which makes Rick's defensive reaction more realistic. 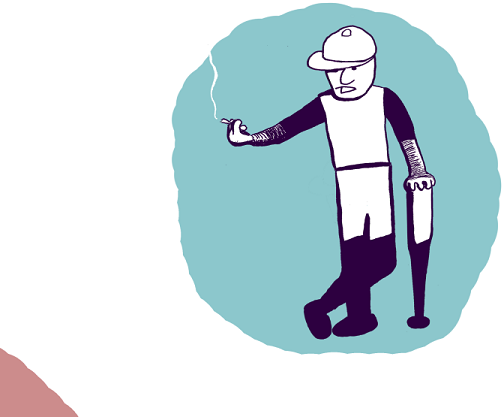 That other baseball player was cool with his cigarette and all, but I had to cut him from the team in order to make my "Not Another Baseball Metaphor" strip a home run. For this cartoon, I decided to keep the foreground almost completely black-and-white and have the colors be behind the characters. The color blobs in the background were all painted with the brush tool on layers that are beneath the foreground layers. 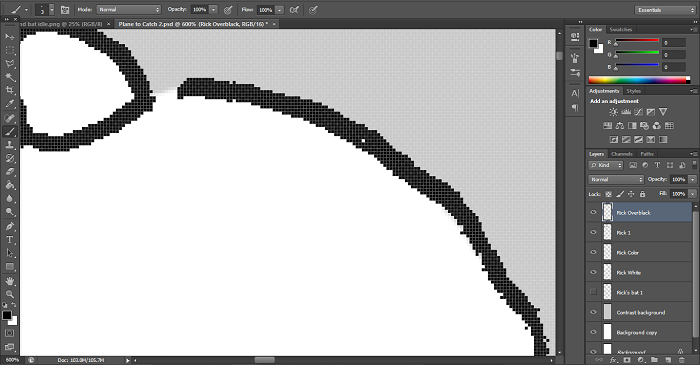 One thing you may not have noticed is the lack of pure black in most of the foreground objects. To make the linework and blackspace of the drawings go better with the colored backgrounds, I made duplicates of the line-work layers, colored each foreground figure a shade of purple that I felt looked good with its corresponding background color, and then set the opacity of these colored duplicate layers to about 30%, in order to give the linework and blackspace a subtle purple tinge. 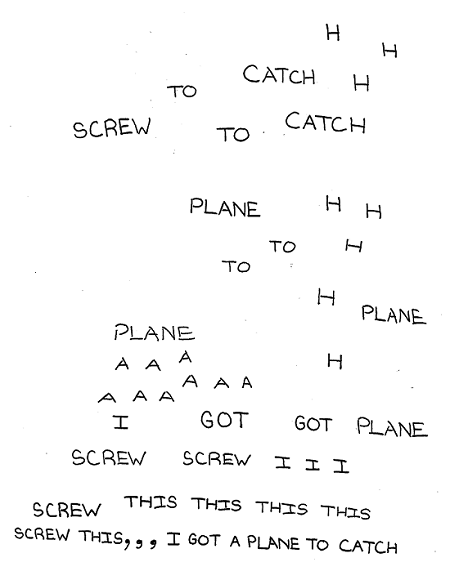 I did not make copies of the whitespace, which I left pure white. As far as I can remember, I didn't apply any special properties to the layers like "multiply," so you don't have to worry about that. Oh God, the lettering. I wrote most of the words out by hand several times and then painstakingly Frankensteined everything together in Photoshop. Again, as I get better at lettering--using an Ames Lettering Guide the way professional comics letterers do--I'll actually draw the words on the same pages as the corresponding pictures, and scan everything together, rather than having to combine everything later. I'm not going to get into what specific tools or what kind of paper I use before I scan things here, as those things require their own posts. Hopefully this post was helpful to some people. Stay tuned to Feldman the Cat as my work habits improve and I start churning out comics at a regular rate. Follow me on Twitter or email me if you have any questions.